If we consider all smartphones in the sub-30k segment and remove those that don’t run on the newest possible version of Android, Motorola is one of the few companies we’re left with. That alone gives the company a huge edge over most of its competitors. Yet, in a gimmick and specs driven market, Motorola has to differentiate itself. And it probably does that better than anyone else with the concept of modularity. So, there are plenty of reasons for considering the Moto Z2 Play amongst phones you may want to buy. Regardless of how a Moto Z2 Play stacks up in reviews, the phone is amongst the most trustworthy and innovative smartphones in recent times. The Moto Z2 Play is mostly an incremental update over last year’s hardware, with a major upgrade in the overall camera performance. 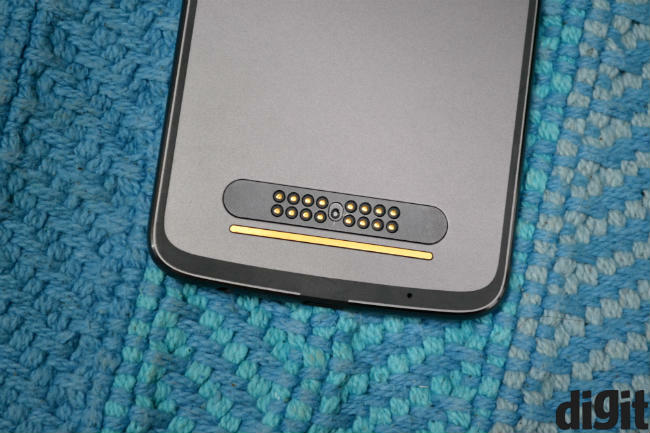 The placement of the magnetic connector has tied Motorola’s hands in terms of design. Hence, the Moto Z2 Play gets the “thinner and lighter” treatment and exchanges metal for glass this time. 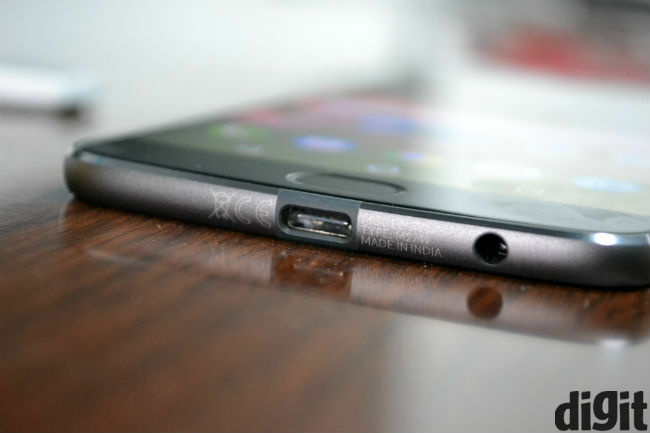 The phone has an unibody metallic design, with the antenna lines running all around the back. It’s a bold choice of sorts, at a time when most OEMs are looking for some clever way to hide the lines. I must admit, Motorola’s design language looks quite good and strikingly unique. The Z2 Play is a millimeter thinner than its predecessor and about 20 grams lighter, and both of these will be evident to anyone who’s used the first version. It’s a remarkably slim and light smartphone, although that also means you’ll need some time to get used to it. The edges are chamfered to avoid digging into your hand, and the overall build feels as sturdy as it gets. On the other hand, reducing the thickness has led the spherical rear camera module to jut out of the body. 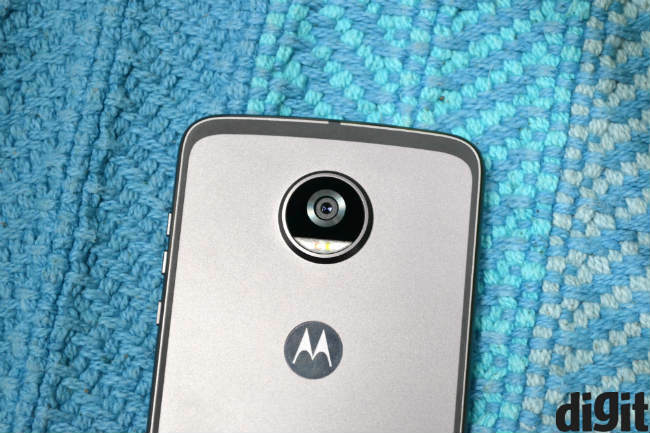 I daresay that it’s a conscious design choice by Motorola, and personally speaking, I quite like how this looks. That said, one must note that protruding camera modules have largely been scoffed at by consumers. You’ll find the power button and volume rocker near the upper right side of the phone. While the power button is easy enough to reach, you’ll have to shift your grip for the volume rocker. The three buttons look similar, so Motorola has a ridged design on the power button, enabling you to recognise it without looking. The Moto Z2 Play isn’t a particularly compact device, but the thin and light form factor somewhat makes up for the large footprint. There’s only one aspect of this phone I’m not particularly fond of, and that’s the front. The Moto Z2 Play has rather large strips above and below the display and though the bezels are tough to spot, they’re quite large too. The strip above the display has the earpiece at the centre, while the front camera and dual-tone flash lie on either side of it. The fingerprint sensor is below the display, with an oval design this time, instead of square as it was on the Moto Z Play (review). The oval sensor feels more intuitive than the square fingerprint reader on last year’s phone. My favourite aspect of the Moto Z2 Play is its display. The company has used Gorilla Glass 3, which produces a premium touch feel. The display is also impressively bright, leaving no room for issues in sunlight. It’s luminance readings were recorded at 930 Lux, the highest we’ve seen on any of our review devices so far. Motorola uses an AMOLED panel here, but colour saturation is toned down to quite pleasant levels. Contrast ratio is impressive with very deep blacks. Barring the Samsung Galaxy A5 (review), I can’t think of another smartphone under 30k that’s so pleasant to look at. 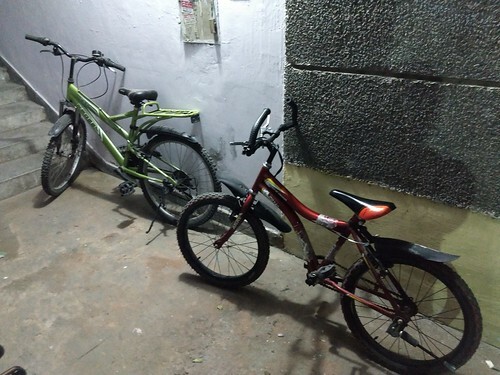 The display is set to the “vibrant” mode by default, which produces pleasant, but slightly oversaturated colours. If you prefer a more natural tone, there’s a “standard” mode within the display settings. Do this before you get used to the vibrant mode though, because things start to look quite dull otherwise. While the two settings work well, I do wish Motorola had provided toggles to tweak primary colours, as on Sony’s smartphones. If not, a few more presets would perhaps have covered a wider audience. Much like any “upgrade” today, the Moto Z2 Play is an incremental update over its predecessor. The Snapdragon 626 offers a 10% boost over the 625 (used last year) and brings in support for dual-camera (although the Z2 Play has a single sensor). It also adds the X9 LTE modem from Qualcomm, which support Category 7 (upto 300Mbps) downlink speeds. It also supports Cat 13 uplink speeds. It still has an octa-core CPU with eight Cortex A53 cores, but the clock speeds have gone up to 2.2 GHz from 2.0 GHz. There’s no noticeable change in performance here. The Moto Z2 Play is smooth as its predecessor was, and it's capable of 60fps gaming if the game in question allows it. Average frame rates remain around the 40-45 frame rate mark though, with bursts of 60fps rendering. You will see occasional lags in graphic intensive games, but the experience remains reasonably smooth. Regular UI performance is decent too, with app load times being reasonably low. That said, I’ve never used a Motorola device with quite as many bugs. Amazon Prime Video crashed multiple times, while the Geekbench 4 benchmark would crashed every time it reached completion. The phone also got stuck at black screens a few times, while on two occasions it detected a non-functional WiFi connection when that was in fact not true. This was tested on two separate WiFi connections. Considering the bugs to be unit-specific, the Moto Z2 Play produces a pretty enjoyable experience otherwise. If you don’t care about specifications in general, the Snapdragon 626 should be sufficient for most users and is competent as far as competition is concerned, including Samsung’s Exynos 7 series chipset on the Galaxy A5. 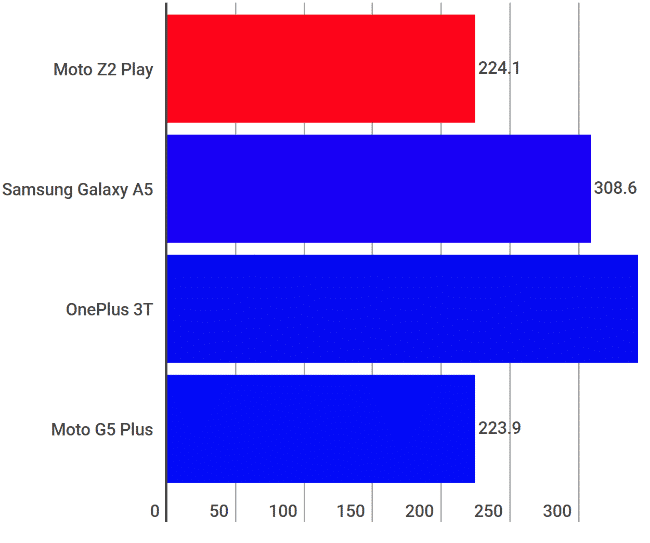 If you’re wondering, yes the OnePlus 3T is much faster. With the exception of the dual-tone front flash, both cameras on the Moto Z2 Play are identical to the Moto G5 Plus. That means this phone gets the excellent dual-pixel camera from the company’s cheaper device. And the results are exactly the same. Reviewing phones like the Moto Z2 Play reveals an interesting insight, that there are no truly exceedingly good cameras in this price segment. As with the G5 Plus, the Z2 Play’s camera does best in daylight. ISO levels remain between 50 and 80 usually and dynamic range is quite high. Colour tones are pleasantly oversaturated and images look excellent. The camera is identical to the Moto G5 Plus, with little to set them apart. But, in doing so the Z2 Play also inherits the G5’s weaknesses. The camera is slow to focus often, leading to blurry photos when on the move. There’s also some noise in finer details, which you’ll want to be aware of if you want to print photos clicked with this phone. The Moto Z2 Play’s camera is not without its faults, but it’s still one of the best cameras in the sub-30k price segment. 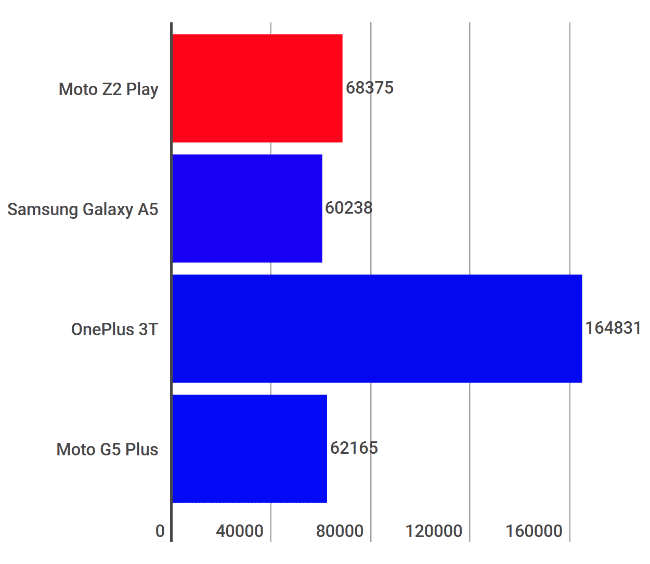 It’s a close one between this and the OnePlus 3T, although the 3T is indeed faster. Swaying from the industry standards here, Motorola has actually reduced battery capacity on the Z2 Play. That’s possibly because of the thinner and lighter form factor and overall battery life is unaffected. The Moto Z2 Play will last you a full day with ease, even on heavier usage. The phone lasted from 10am to 10pm with 10 phone calls, 20 minutes of camera usage, half an hour of gameplay and lots of IMs and social networking. That’s amongst the best battery life you can get from smartphones today. Spec-to-spec, the Moto Z2 Play is not a better smartphone than the OnePlus 3T (review). But, I’d actually recommend this smartphone to most users. That’s because Motorola’s phone comes with the promise of at least on Android update, it’s good from the UX point of view, has a great camera and remarkable battery life. Adding the modular element to that makes this phone more value for money and possibly longer lasting. Considering that OnePlus just went back on its word to provide Nougat on the OnePlus 2, I’m inclined to trust Motorola more. So, yes, if you’re considering a phone under Rs. 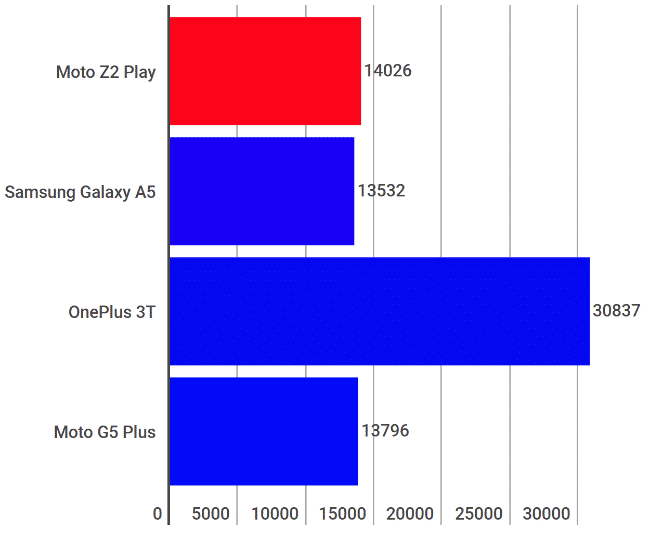 30,000, you should consider the Moto Z2 Play for sure.